I have a bit of a confession; I am a bit of a trainspotter. In Canada, I never really cared so much about trains but once I came to Tokyo, I was introduced to so many different trains and train lines. I had a hell of a time trying to get my head around the various maps and understanding why there were so many trains and why the fares were so confusing. It took 6 months before I could travel around Tokyo smoothly, and another 2 years before I could confidently travel around Tokyo without much fear of taking the wrong train. I still take the wrong train from time to time but I don’t worry about it as much. I have gotten so used to taking trains in Tokyo that I have no problems when I visit a new area and the train system is a mess. I can relatively easily figure it out. My time in Japan, and Tokyo, has helped me grow a fondness for Japanese designed trains. They look very cool and modern and I enjoy the general aesthetics of the trains. While I am not a huge trainspotter, I do enjoy looking at them and taking photos of new trains that I take. I recently had a need, for my upcoming book, to take photos of all of the trains in central Tokyo. While I didn’t take photos of every train type, I did get photos of every train company’s trains in Tokyo and learned a few good tips if you ever want to take photos. The first thing to learn is where to go. There are specific stations in Tokyo where you can see more trains than others. 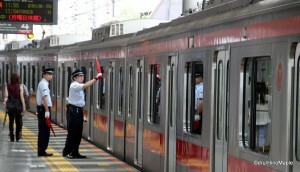 If you are taking the Oedo Line, you are likely to see only 2 or 3 trains and they all look the same. They are all different versions of the same train. In my experience, the best train station to see the largest variation of trains is Naka-Meguro Station. Located just west of Shibuya, Naka-Meguro Station is a joint station operated by the Tokyu Corporation and Tokyo Metro. 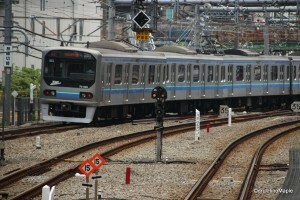 There are two train lines that run through Naka-Meguro, the Toyoko Line and the Hibiya Line. The Tokyo Metro’s Hibiya Line terminates at Naka-Meguro but the Hibiya Line has through services on the Tobu Line at Kita-Senju Station. This allows you to see both the Tokyo Metro’s Hibiya Line trains as well as some of Tobu’s trains. 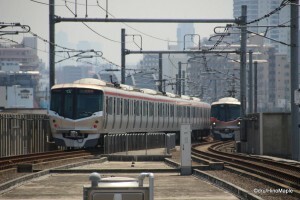 The Toyoko Line connects in Shibuya to the Tokyo Metro’s Fukutoshin Line as well as the Seibu Lines that head to Saitama. While it is more common to see the Tokyu trains here, you can see a lot of Fukutoshin Trains as well as a couple Seibu Trains from time to time. Add to the fact that this station is located outside and you have a station with good lighting and lots of trains to choose from. Another train station where you can see multiple trains at the same time is at Kita-Senju, although it is not as good as Naka-Meguro or Shinagawa. 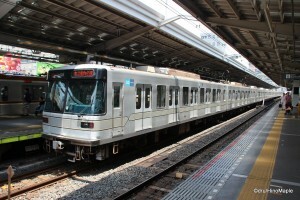 At Kita-Senju, you can visit the Tsukuba Express, the Tobu Lines, the Hibiya Line, the Chiyoda Line, and the JR Lines. Unfortunately only a few of them are interconnected and only some of the Tobu Lines, some of the JR Lines, and the Tsukuba Express lines are above ground. For cost performance purposes, Naka-Meguro is still the best station that I have been to. During my travels, I was able to learn a couple important things when trainspotting. The first is to go to the terminus if you want good photos of the trains at the station at all times. 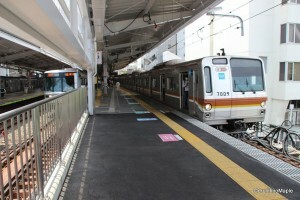 Most of the terminus stations have wider platforms making it easier to photograph the trains. Some terminating stations, such as Shibuya Station for the Fukutoshin Line is not a good station as it is a through station. You can see a lot of trains but the platforms can be very crowded, especially for the Tokyo Metro stations. The other important thing I learned is that many train stations have a special platform entry ticket. Not all ticket machines offer them but you can find them. They are located at the bottom right of the screen and generally cost the lowest fare possible. Each station is different as the fare to the neighbouring station is also different. The platform entry ticket is called Nyujoken (入場券) and generally allows you to spend up to 2 hours on the platform. I wish I had known this before as I was constantly buying regular tickets at first for just 1 station and then going through the attendant. This may be required if you can’t find a ticket machine that has the special platform ticket available. You just have to purchase the cheapest ticket, enter the station, and then exit via an attendant. The attendant may ask if you have taken a train somewhere but generally they will just let you out. I don’t consider myself a big rail fan but I do enjoy learning about the technology and seeing the progression of train car design. You might call me more of a technology junkie or someone who enjoys industrial design. I don’t necessarily look for information on how each train has different motors but I do enjoy seeing new developments such as new TV screens and modern looking lighting in the trains. Japan has a weird way of making people interested in trains. I have my own secret spots for seeing many trains pass and some not so secret spots as well. If you are a rail fan walking about in Tokyo, be sure to follow the lines a bit and don’t put your tripods over the yellow lines. I have seen many Japanese rail fans get into a little trouble that their tripod legs are just over the yellow line, and also don’t head to the extreme front of the platform as you generally aren’t allowed to lean over the fence at the ends of the station. I know this from personal experience. The best way to avoid breaking the rules is to look for the yellow raised lines around the platform and never cross over it. Never lean over any barriers and bring a zoom lens as it will make things a lot easier when taking photos. This entry was posted in Tokyo, Travel and tagged Asakusa Line, Chiyoda Line, do re me train, do re mi, do-re-mi train, Fukutoshin Line, Hibiya Line, japan, Japan Rail, JR, JR Line, JR Train, Keikyu, Keisei, Kita-Senju, Kita-Senju Station, Metro, Naka Meguro, Naka Meguro Station, Nyujoken, Oedo Line, Platform ticket, rail fan, Seibu Line, Shinagawa, Shinagawa Station, Tobu, tokyo, Tokyo Metro, Tokyo Sky Tree Line, Tokyu, Tokyu Corporation, Toyoko Line, train, trains, Trains in Japan, Trains in Tokyo, trainspotter, trainspotting, Tsukuba Express, Yurakucho Line by Dru. Bookmark the permalink. Oh, man, Dru, you should’ve seen my huge silly grin while reading this post and watching that video! As you know, I’m a train freak beyond hope and redemption. 😀 I love Japan’s trains, with one exception: morning rush hour trains. The funny thing about me learning about that silly fact, I saw it on a comedy show where they had nothing but comedians who are densha-otaku. They made jokes and fawned over the various train details. Fast forward to 3:00 to get the sound. Ooo. I like your Skytrain. They have it every now and then. It is on a show called Ametalk. Not sure if you know it or not. That begs the question: Have you seen Dr. Yellow? Lucky you. I work next to Yurakucho Station but my office faces the wrong side. Also, I thought it was meant that if you see the Doctor Yellow on the platform, you’ll have good luck for your trip… Not sure if I’m correct or not. I’ve never seen Dr. Yellow. I don’t live in a Shinkansen city, so it may be difficult for me to see it by chance. The train otaku however, know the timetables and can wait for it. That’s good for getting pictures, but I feel like that’s cheating when it comes to getting luck.